Winter in Australia is not the same as in Europe, there is no snow and if temperature drops to 5C it’s considered cold. It’s still sunny and relatively warm most of the time. However, there are no more weekends spent at the beach, swimming in the rock pools and sipping cold cocktails in a bar with an ocean view. Fortunately, Australian winters aren’t long, only 2 more months to go and we’ll be back at the beach! 1. 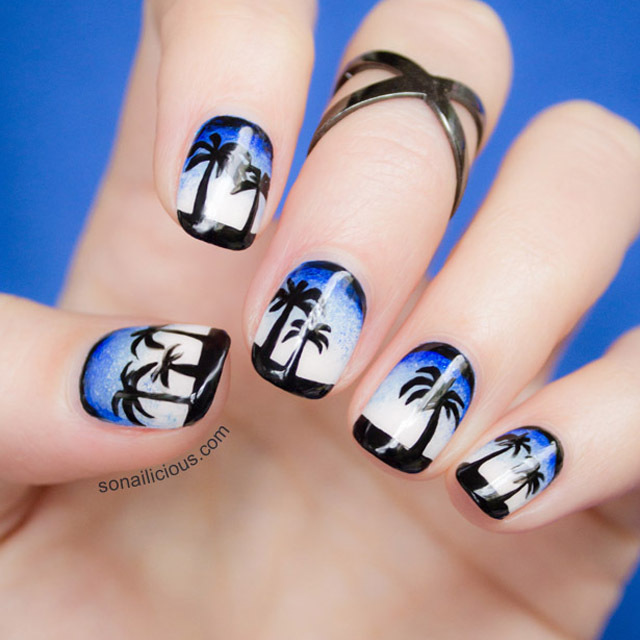 Stormy Beach Nails inspired by Palm Cove Beach, Cairns, Australia. Used: Orly Royal Navy, Softest White, Snowcone (baby blue) and Vinyl (black), Essie Good To Go Top Coat (used for all nail designs). Wearing Sportsgirl ring. 2. 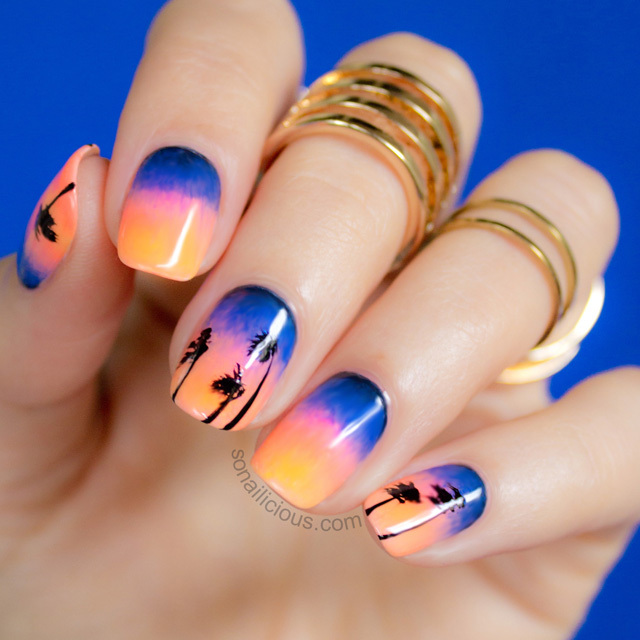 Epic Sunset Beach Nails inspired by an epic sunset. This is also a #TwinsieNails project with Tamara @ohmygoshpolish. Used: Orly Royal Navy, Mayhem Mentality (Orange), Choreographed Chaos (pink), Vinyl (black) and Hello Darling Rubber Duckie (yellow). 3. 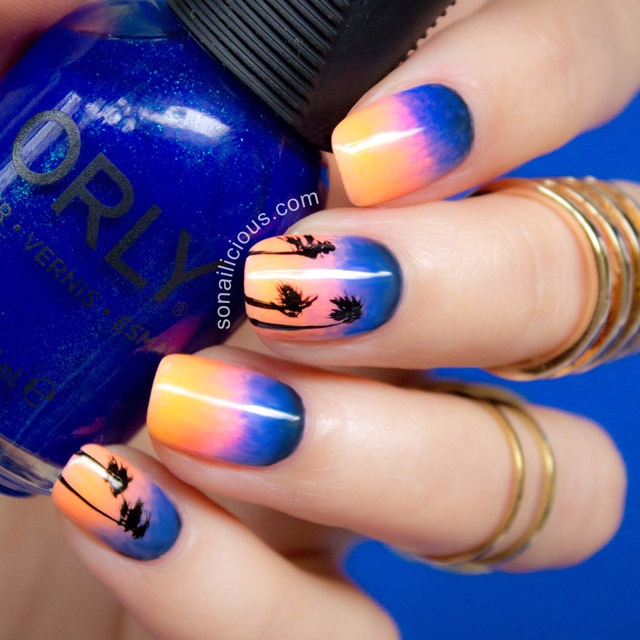 Dusk Beach Nails inspired by an evening in Shelly Beach in Sydney, Australia. 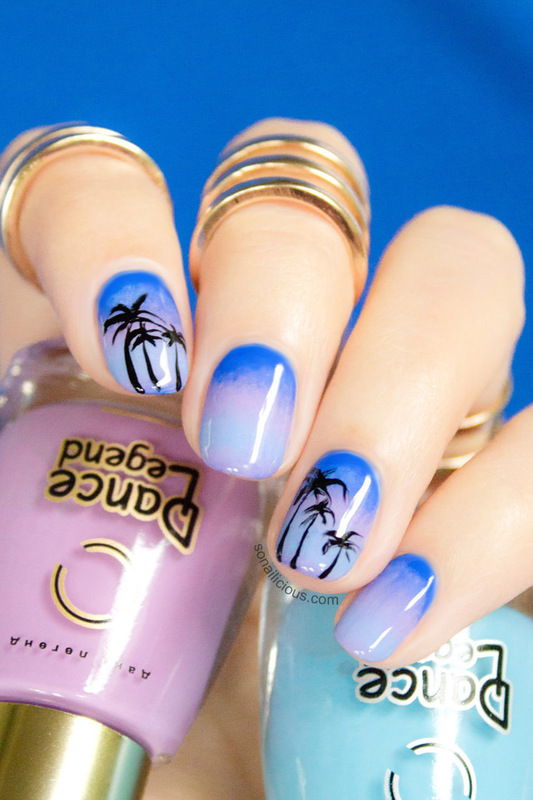 If you’d like to learn how to do this look, check out this Beach Nails Tutorial we did for Substance Blog. Used: Kester Black Raspberry, Dance Legend Baby Blue and Light Lilac. Wearing Gold Knuckle Rings. 4. 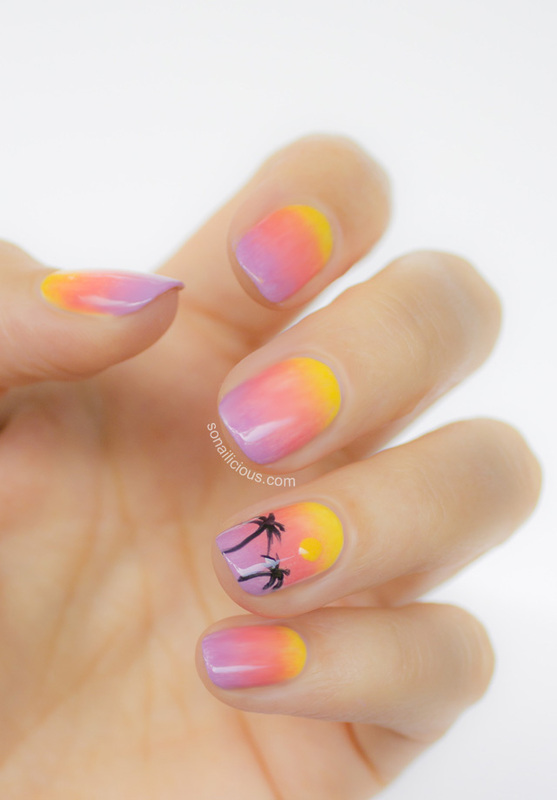 Summer Sunset Beach Nails inspired by sunset at St Kilda Beach in Melbourne, Australia. 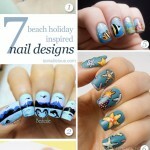 Used: Bio Sculpture Beach Holiday collection polishes. 5. Hobart Docks Nails inspired by Hobart in Tasmania, Australia, Another #TwinsieNails project with Tamara @ohmygoshpolish. Used: Kester Black Raspberry and Dragonfruit, Orly Vinyl (black) and Hello Darling Rubber Duckie (yellow). The great thing about beach nails are the endless opportunities for creativity. 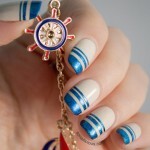 Just pick a photo of a beach you like and find matching polish colours to re-create it on your nails. 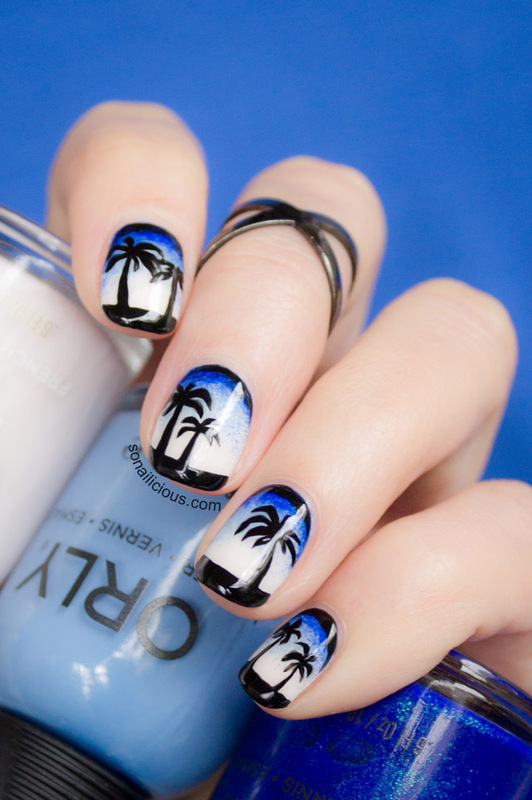 Plus, beach nails are relatively easy to do – first, do a quick gradient, then paint some palms or other patterns, seal everything with a top coat and you’re done! 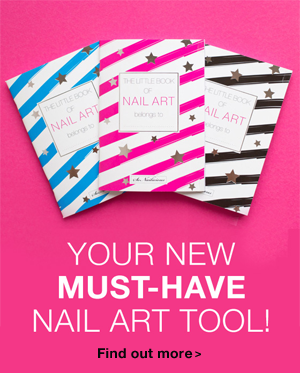 If you need some guidance refer to this beach nails tutorial from the SoNailicious book. Have you ever been inspired by a beach to do something creative? We’d love to hear about your favourite inspirational places! 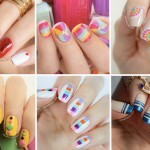 Looking for more summer nail ideas? 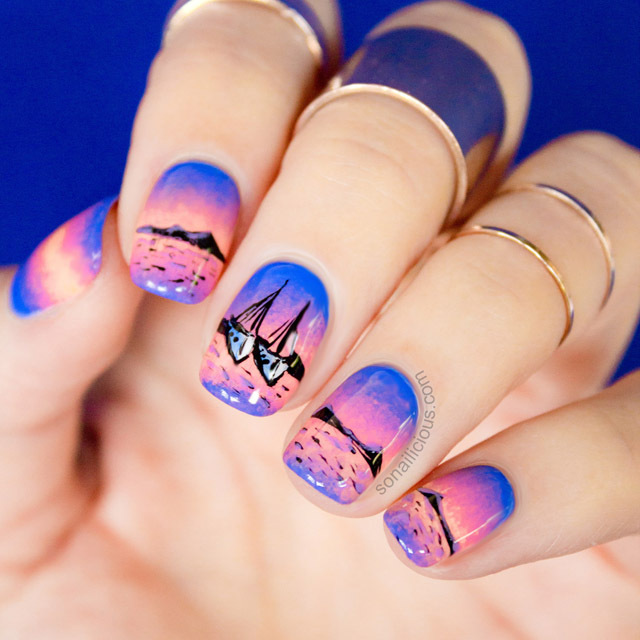 You’ll love these Summer Nail Designs (with tutorials!) 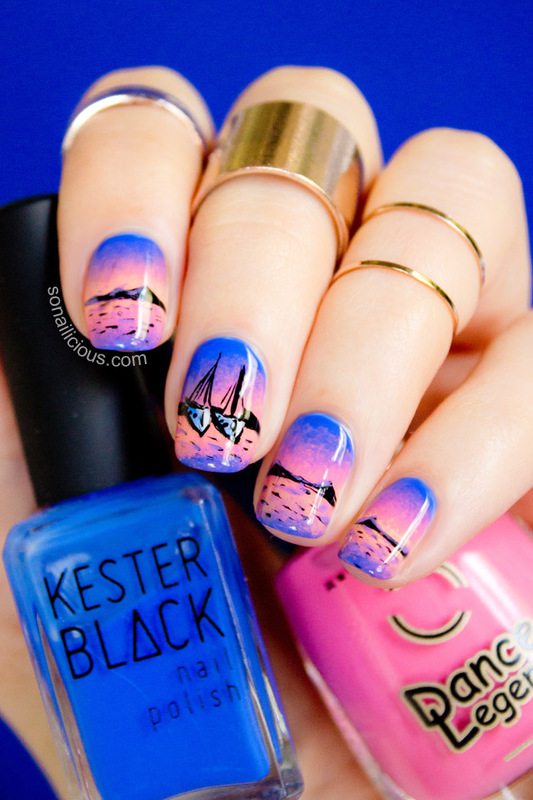 and these 7 genius Beach Nail Designs. 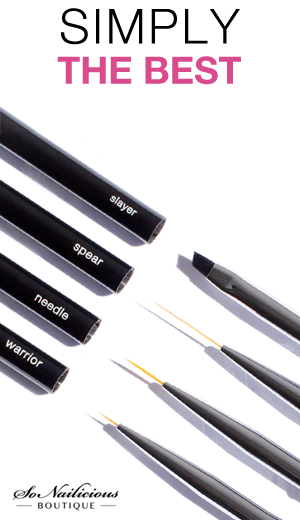 Stay in touch by subscribing to our Weekly Newsletter or follow us on Bloglovin for daily updates.